Egyptian universities have resumed the second day of the new semester amid a tense atmosphere marked by condemnation and calls for protests. 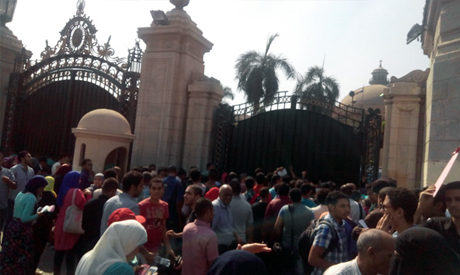 Cairo University has closed its doors in anticipation of demonstrations. Seventy-eight students were arrested from their homes nationwide early Sunday and Saturday. A statement has been issued early Sunday signed by students representing 6 April movement, Dostour Party, Egypt’s popular current, Strong Egypt party and many other movements demanded the immediate release of all the detained students. Spokesperson for April 6 university students, Ahmed Shaaban, explained to Ahram Online that many of the detained students are members of "Students against the Coup" and supporters of ousted Islamist President Mohamed Morsi. The statement also highlighted that the students will be organising events to call for the release of their colleagues. "208 students have died in university clashes and 1,851 have been detained with thousands injured while no one has been held accountable, we demand a law that respects the rights of students and that guarantees their right for freedom of expression," the statement read. "The students have been detained from their homes from different governorates around the country such as Tanta, Assiut and Mansoura," said Shaaban. Shaaban added that lawyers are working on reaching those students arrested this morning and that the exact number of those detained cannot be confirmed. Meanwhile, security forces have intensified their presence outside of Cairo and Ain Shams University as students have called for protests on Sunday. Egyptian public universities opened Saturday for the new semester with increased security measures. Public universities were a site for frequent clashes last year between police and students, with at least 14 students killed in the violence and hundreds jailed for illegal protesting or participating in violence. Hundreds of students were also either expelled or suspended from universities nationwide. While street protests held by Morsi supporters have dwindled over the past year, university demonstrations grew, as they were viewed as an alternative to street protests over the past academic year.